Last night, I attended the Cool Women, Hot Food, #MakeItHappen Event at CookSpace in Ward. The dinner celebrated International Women's Day with women chefs and farmers who make it happen in their community. Participating farmers included: Shin Ho of Ho Farms; Sabrina St. Martin and Monique van der Stroom of Naked Cow Dairy; Candy Suiso of Makaha Mangoes; Amy Shinsato, of Shinsato Farms; and Michelle Galimba of Kuahiwi Ranch. 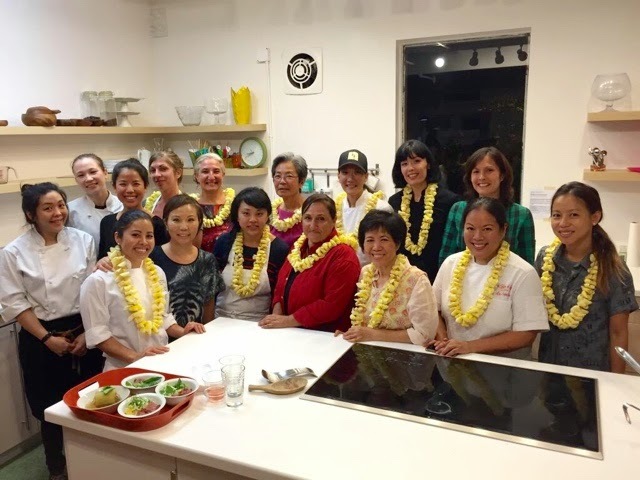 Featured women chefs were: Lee Anne Wong of Koko Head Café; Michelle Karr-Ueoka of MW Restaurant; Dianna Daoheung of Black Seed Bagels; Loan “Mama" Le of Pig and the Lady; Christina Lilia Hee of Juicy Brew; and Nanako Tsuji Perez-Nava and Carmen Montejo of the Moana Surfrider. 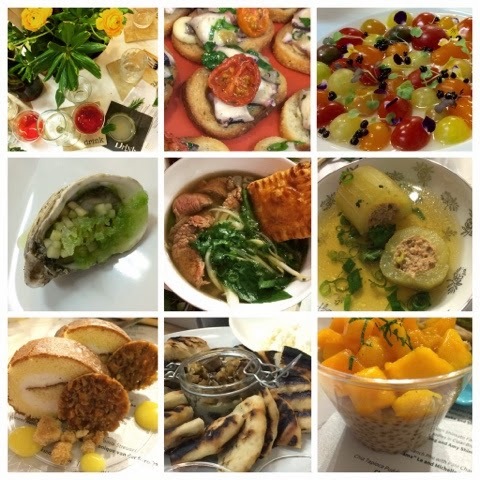 I am a huge fan of both Lee Anne Wong and Michelle Karr-Ueoka (and their restaurants) so this was an amazing event for me to attend. What made it even better was that this special night benefited the Feed the Hunger Foundation, which through their micro financing programs empowers individuals, including many women farmers to build sustainable businesses. Paepae o He’eia He’e; Ho Farms Tomato Salad Pickled Umeand Cherry Blossom Gelee; Kushi Oysters and Ho Farms "Shaved Cucumber Namasu," Mignonette; Kuahiwi Ranch Beef Pho with Pate Chaud; Stuffed Cucumber with Shinsato Farms Pork Glassy Noodles in Clear Broth; Haupia Coconut Roll Cake with Naked Cow Dairy Lilikoi Curd and Macadamia Nut Streusel; Ho Farms Eggplant "babaganoush" with MW Taro Flatbread; and Chia-tapioca Pudding with Makaha Mangoes and Cashews. It was such a memorable evening filled with inspiring women. I hope to attend more collaborations like this in the future. CookSpace is a 1000 square foot cooking studio and event venue offering cooking classes, tastings, and culinary experiences. The studio is available as a private event space. CookSpace is located on the second floor of Ward Warehouse, above Paina Cafe.